I realize my PSA 15V can't get to super low frequencies so for the Irene scene in BHD, I felt nothing. It is my understanding that it dips down to 7hz. How often do people intentionally do that to mixes? Seems a bit random to pop in that low mix when honestly the majority of BHD isn't your sub tester? So the question is, do I keep happy with the range my sub can handle and add another? Seriously? You really want to add stuff, eh? If you can blow yourself and your wife away with a movie scene now, why add another? Of course, there are benefits to adding a second matching sub and setting them up properly, but increasing the deep base may not be one of them. Sometimes bass effects are added specifically to blow you away, even though the engineer and director know few will ever experience it. Other times the engineer adds a sound effect without taking into account the amount of bass in the original effect while on the rest of the soundtrack they carefully limit the bass to prevent damage to theater and home users' systems. Ha ha. I'm starting to think Flint is rolling his eyes at all my talks of adding or changing. Possibly even pulling his hair out. . In reality, with our smaller home, anything beyond matching the subs would get me evicted...by my wife. I think the overall punchline is I can't do anything bigger until I upgrade the home. Ha, I have no idea. Just pulled it off google images in order to furnish you and everyone here with an extremely clever post. NERD ALERT!!! DO NOT READ BELOW IF YOU DON'T WANT TO READ BORING, NERDY, "BUT THOSE ARE THE FACTS" B.S. I AM FAMOUS FOR POSTING!!! Those are cinema sound speakers designed to project fairly loud audio into a large cinema space. They are designed to be listened to from distances starting at approximately 6 meters, but are tuned for their best performance when listening at 12 to 20 meters. They have incredibly high sensitivity, like over 100dB SPL at 2.83V input, and they handle enough power to generate well over 125dB SPL, often getting into the >130dB SPL. From the looks of that room, the listener is likely sitting about 8 to 12 feet from those speakers. This is going to be fraught with issues unless the owner make the effort to replace the crossovers and retune the system to sound good at his actual listening distances. For instance (and this is just one example), treble is absorbed by the air. In home audio this is rarely an issue because the amount of absorption between 1 meter and 3 meters is not that big a deal. However, if a speaker is tuned to have a clean, clear, and crisp treble output at 95dB SPL while sitting 20 meters away, that means the treble output at 3 meters could be painfully piercing like razor blades slicing your eardrums. We have all experienced it when sitting in the front rows of older theaters which tended to have constant directivity horns. What we thought was a piercing tone from it being louder (since we were closer) was also from the treble being much brighter because we were closer. 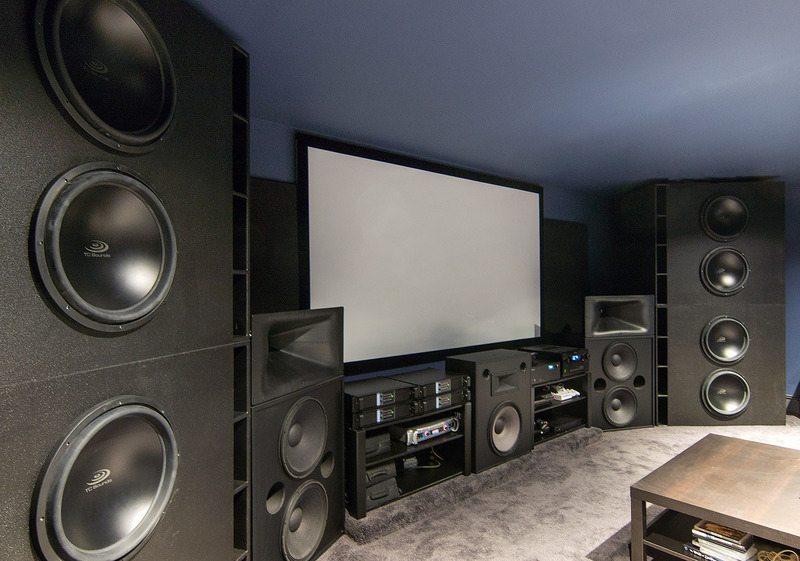 Many modern high end cinema speakers have controlled directivity horns which have less treble output at the edges of their polar patterns and if aimed correctly will project high treble towards the rear of the cinema and less down toward the front rows. That said, in the setup in the photo the listener can be presumed to be directly in front of the horns, and with the cabinets angled as they are it suggested the listener is looking straight down the throat of the horns. That is the worst possible listening position for most modern horns. In fact, most modern horns sound best when the listener is about 10 to 20 degrees off axis and often, for this style of direct radiating horn (as opposed to line array horns), installers often aim the direct 0 degree output direction to an aisle or above and behind the audience to reduce that harsh, "horn-like" sound. So... While that setup certainly looks impressive, it appears to be a classic example of using an incredible tool for the wrong job. I was commenting on PaulyT's post - as a general comment about proper set-up. If any of it is of use for your situation, that's great. I know. I was messing with you.